The best way to describe the DiMarzio Air Zone™ is to say it's a vintage version of The Tone Zone®. It's got the same low string-pull as DiMarzio's other Airbuckers™ for singing sustain, plus it has the big bass response and cool harmonics of The Tone Zone, with extra sensitivity and control. It's a great match for very hot amps, allowing the player to take full advantage of massive preamp gain without turning the sound to mud or fuzzy noise. It's also a great neck pickup for jazz players who need to get the hollow-body arch top sound from a solid body, and it offers exceptionally good split and series-parallel capability. 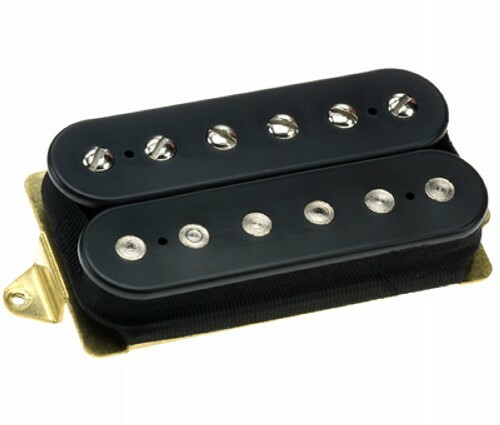 The DiMarzio Air Zone provides ultra-fat PAF sound with more output. The dynamic range from soft to hard picking is very wide, and the combination of dual-resonance coils with the Airbucker magnetic field allows sustained notes to hang on to harmonic overtones longer, instead of becoming muddy as they fade. Will also work as a very warm, full neck pickup for jazz sound, and combines well with The Tone Zone, Super Distortion and Super 3 in bridge position. Recommended for Bridge position primarily (see above for neck position application) in solid body and semi-hollow body guitars.